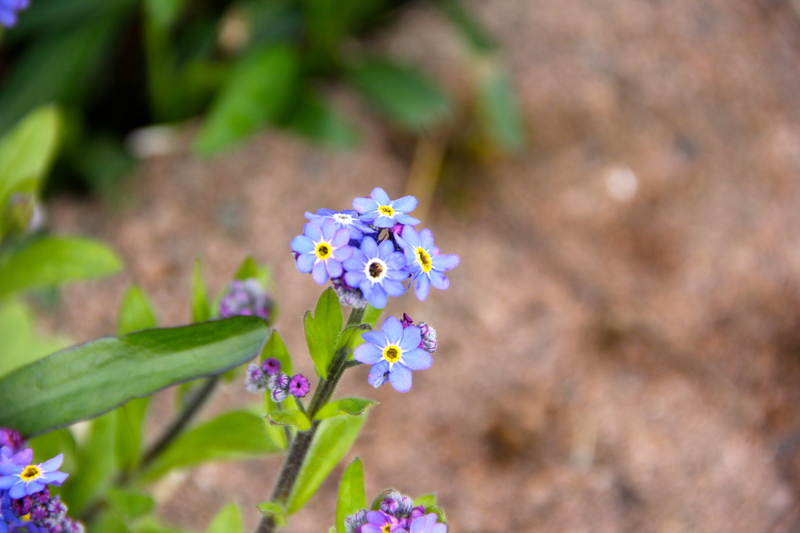 We enjoyed a beautiful Easter week with generous and loving family and returned to many changes in the garden. 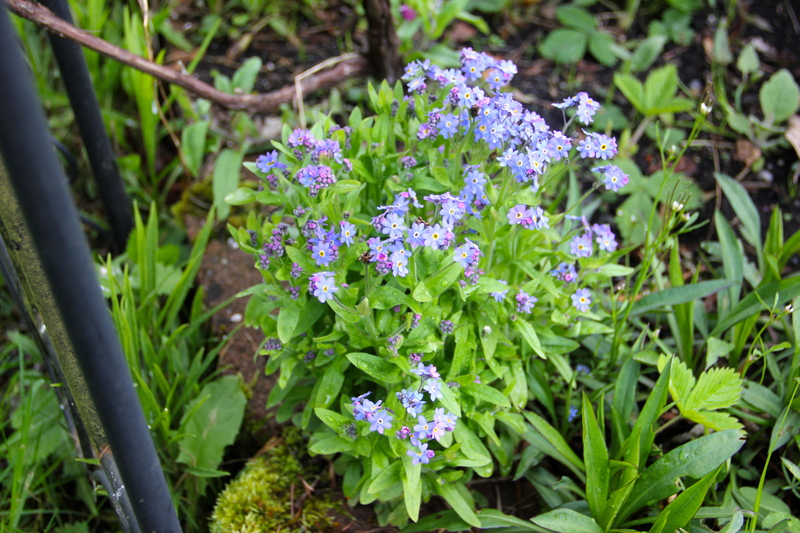 It’s always difficult to say goodbye, and how appropriate is it that one of the plants now in full bloom here is Myosotis sylvatica or Forget-Me-Not. 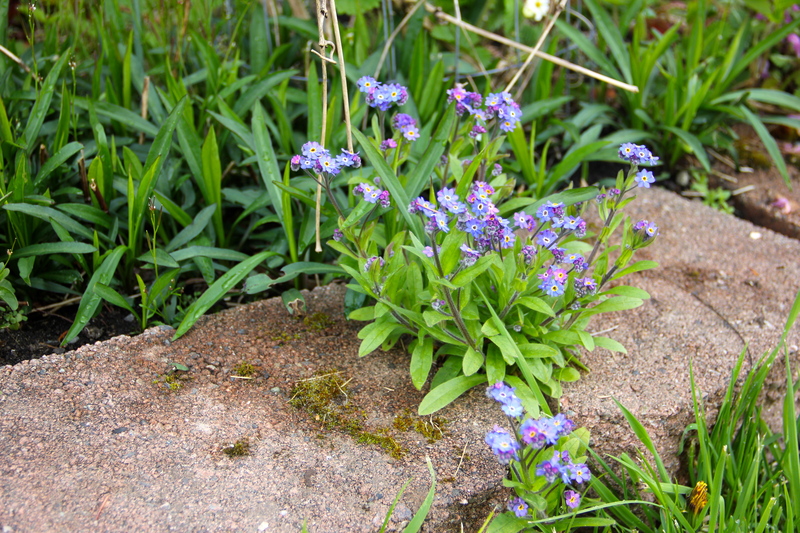 I haven’t grown these before and am thrilled by the shades of purple and blue these tiny flowers reveal as their clusters open. 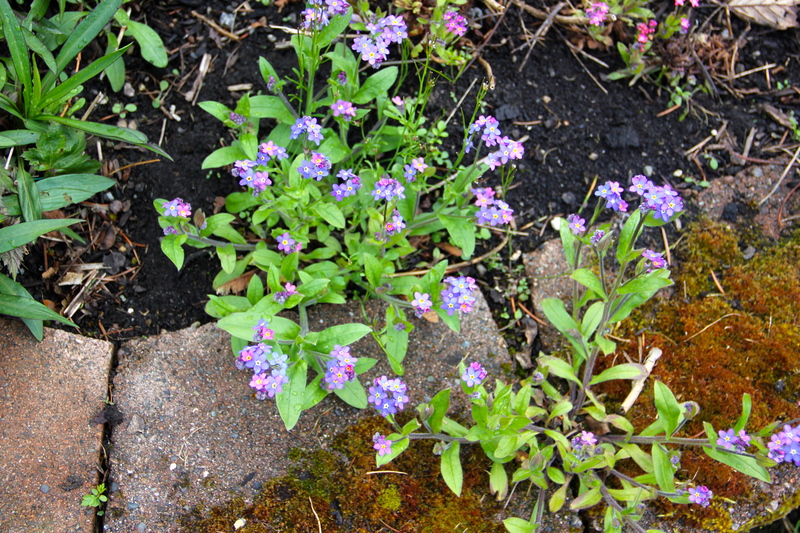 Forget-Me-Nots are scattered throughout the perennial beds and in front of the house, and probably due to birds and breezes spreading them, they randomly appear in odd locations around Coppertop. 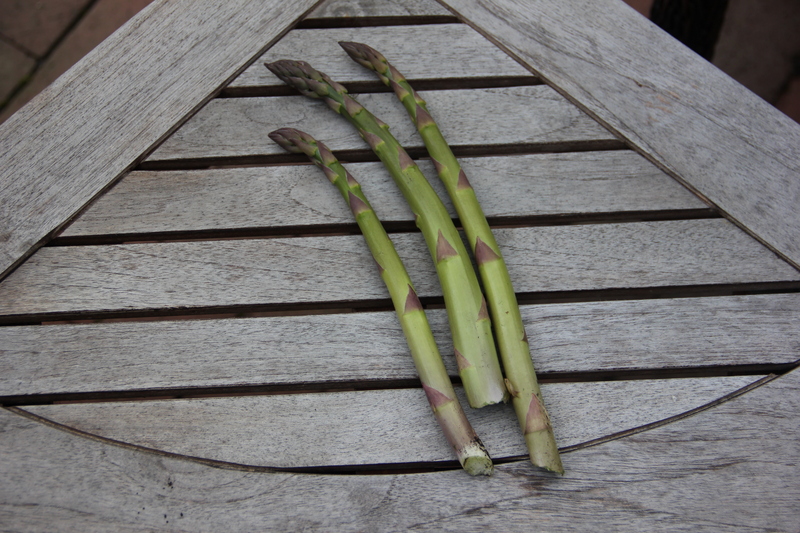 A couple dozen asparagus spears have proudly emerged following that first shoot. This morning I cut the first three spears that had reached almost a foot high. I didn’t wait to prepare them, but washed them outdoors and ate one in the garden! Superbly sweet, crunchy, tender, nutty, and delicious. 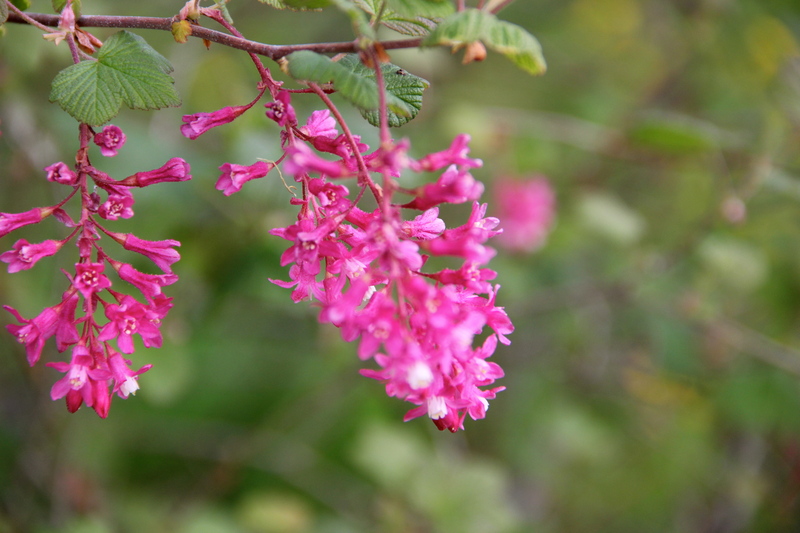 The red flowering currant bushes – the Ribes sanguineum that I wrote of almost a month ago – are still in gorgeous bloom. There’s much work to be done. We must mow these expanses of lawn very soon or we will certainly lose the dog. Although the riding mower works well, many areas are too steep or too narrow to use it, and our regular mower is in the shop. It hadn’t been run since 2010 because we’d been living in Portugal, and our landlord provided professional lawn care by charming Claudio and Davide. So, the unused mower only coughed and wouldn’t start. All this is my lengthy explanation for the abundant dandelions soon to appear in Coppertop photos. It’s pretty impossible to use the string trimmer/weedwacker on a couple of acres, and I’m not quite crazy enough to trim grass by hand. 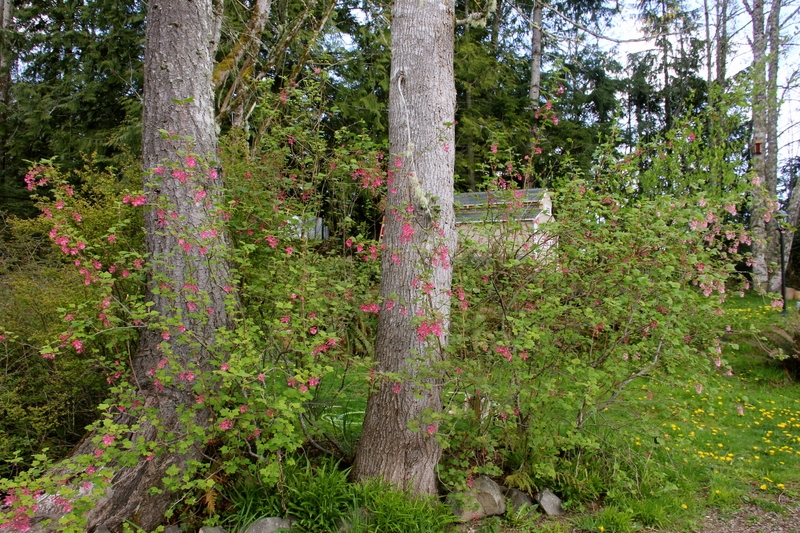 This entry was tagged asparagus, Coppertop, flowering currant, forget-me-not, gardening, myosotis sylvatica, Olympic Peninsula, Pacific Northwest gardening, ribes sanguineum. Bookmark the permalink.